Freshly fallen snow – a moment of quiet winter beauty. 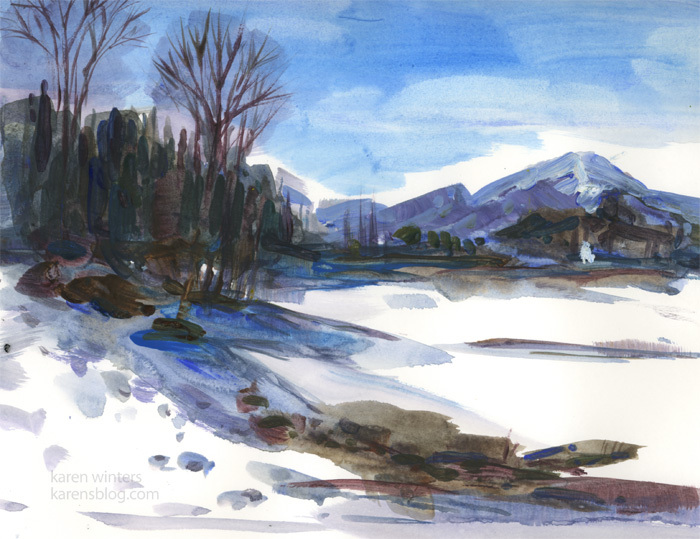 In this sketch I’m using acrylic in a watercolor manner. I’ll write more later – things are busy right now. Karen, This is very nice. I love your controlled looseness (if there is such a description). You have been busy. Have a great Christmas and holidays. Nice cold feeling to your scene. And I think the way you merged your lights and your darks adds to the effectiveness of your painting, as do the warms browns against the icy blues. Good work!